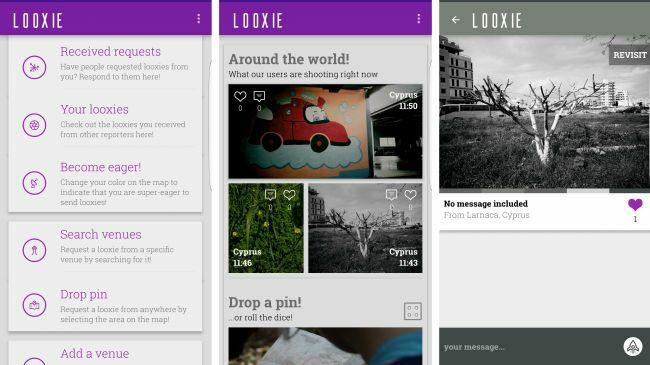 Looxie is a great idea that’s currently lacking enough users to fulfil its potential, but is very worth keeping an eye on. Essentially, if you want to see where somewhere looks right now – be it as vague as a country or as specific as a bar – you can just make the request on the app, and if there are any users in that location they’ll be prompted to send you a photo. This could be used to see how bad the traffic actually is, how choppy the sea is, how crowded your favorite bar is or whether the supermarket is open, among many other things, but is likely to be used as much just out of curiosity about more exotic locales. Want to see what the center of Tokyo looks like right now? Request a picture. How about the top of a mountain? You know what to do. Right now there aren’t anywhere near enough users to reliably get a response, but you can help change that by downloading the app and taking photos that others request.